Phospho-NF- kappaB p65 (Ser536) Antibody detects endogenous levels of NF- kappaB p65 only when phosphorylated at Serine 536. Rabbit IgG in phosphate buffered saline , pH 7.4, 150mM NaCl, sodium azide and glycerol.Store at -20 °C.Stable for 12 months from date of receipt. A synthesized peptide derived from human NF- kappaB p65 around the phosphorylation site of Serine 536. NFKB1 (MIM 164011) or NFKB2 (MIM 164012) is bound to REL (MIM 164910), RELA, or RELB (MIM 604758) to form the NFKB complex. The p50 (NFKB1)/p65 (RELA) heterodimer is the most abundant form of NFKB. The NFKB complex is inhibited by I-kappa-B proteins (NFKBIA, MIM 164008 or NFKBIB, MIM 604495), which inactivate NFKB by trapping it in the cytoplasm. Ubiquitinated, leading to its proteasomal degradation. Degradation is required for termination of NF-kappa-B response.Monomethylated at Lys-310 by SETD6. Monomethylation at Lys-310 is recognized by the ANK repeats of EHMT1 and promotes the formation of repressed chromatin at target genes, leading to down-regulation of NF-kappa-B transcription factor activity. Phosphorylation at Ser-311 disrupts the interaction with EHMT1 without preventing monomethylation at Lys-310 and relieves the repression of target genes (By similarity).Phosphorylation at Ser-311 disrupts the interaction with EHMT1 and promotes transcription factor activity (By similarity). Phosphorylation on Ser-536 stimulates acetylation on Lys-310 and interaction with CBP; the phosphorylated and acetylated forms show enhanced transcriptional activity. Phosphorylation at Ser-276 by RPS6KA4 and RPS6KA5 promotes its transactivation and transcriptional activities.Reversibly acetylated; the acetylation seems to be mediated by CBP, the deacetylation by HDAC3 and SIRT2. Acetylation at Lys-122 enhances DNA binding and impairs association with NFKBIA. Acetylation at Lys-310 is required for full transcriptional activity in the absence of effects on DNA binding and NFKBIA association. Acetylation at Lys-310 promotes interaction with BRD4. Acetylation can also lower DNA-binding and results in nuclear export. Interaction with BRMS1 promotes deacetylation of Lys-310. Lys-310 is deacetylated by SIRT2.S-nitrosylation of Cys-38 inactivates the enzyme activity.Sulfhydration at Cys-38 mediates the anti-apoptotic activity by promoting the interaction with RPS3 and activating the transcription factor activity.Sumoylation by PIAS3 negatively regulates DNA-bound activated NF-kappa-B.Proteolytically cleaved within a conserved N-terminus region required for base-specific contact with DNA in a CPEN1-mediated manner, and hence inhibits NF-kappa-B transcriptional activity (PubMed:18212740). Component of the NF-kappa-B p65-p50 complex. Component of the NF-kappa-B p65-c-Rel complex. Homodimer; component of the NF-kappa-B p65-p65 complex. Component of the NF-kappa-B p65-p52 complex. May interact with ETHE1. Binds AES and TLE1. Interacts with TP53BP2. Binds to and is phosphorylated by the activated form of either RPS6KA4 or RPS6KA5. Interacts with ING4 and this interaction may be indirect. Interacts with CARM1, USP48 and UNC5CL. Interacts with IRAK1BP1 (By similarity). Interacts with NFKBID (By similarity). Interacts with NFKBIA. Interacts with GSK3B. Interacts with NFKBIB (By similarity). Interacts with NFKBIE. Interacts with NFKBIZ. Interacts with EHMT1 (via ANK repeats) (By similarity). Part of a 70-90 kDa complex at least consisting of CHUK, IKBKB, NFKBIA, RELA, ELP1 and MAP3K14. Interacts with HDAC3; HDAC3 mediates the deacetylation of RELA. Interacts with HDAC1; the interaction requires non-phosphorylated RELA. Interacts with CBP; the interaction requires phosphorylated RELA. Interacts (phosphorylated at 'Thr-254') with PIN1; the interaction inhibits p65 binding to NFKBIA. Interacts with SOCS1. Interacts with UXT. Interacts with MTDH and PHF11. Interacts with ARRB2. Interacts with human respiratory syncytial virus (HRSV) protein M2-1. Interacts with NFKBIA (when phosphorylated), the interaction is direct; phosphorylated NFKBIA is part of a SCF(BTRC)-like complex lacking CUL1. Interacts with RNF25. Interacts (via C-terminus) with DDX1. Interacts with UFL1 and COMMD1. Interacts with BRMS1; this promotes deacetylation of 'Lys-310'. Interacts with NOTCH2 (By similarity). Directly interacts with MEN1; this interaction represses NFKB-mediated transactivation. Interacts with AKIP1, which promotes the phosphorylation and nuclear retention of RELA. Interacts (via the RHD) with GFI1; the interaction, after bacterial lipopolysaccharide (LPS) stimulation, inhibits the transcriptional activity by interfering with the DNA-binding activity to target gene promoter DNA. Interacts (when acetylated at Lys-310) with BRD4; leading to activation of the NF-kappa-B pathway. Interacts with MEFV. Interacts with CLOCK (By similarity). Interacts (via N-terminus) with CPEN1; this interaction induces proteolytic cleavage of p65/RELA subunit and inhibition of NF-kappa-B transcriptional activity (PubMed:18212740). Interacts with FOXP3. Interacts with CDK5RAP3; stimulates the interaction of RELA with HDAC1, HDAC2 and HDAC3 thereby inhibiting NF-kappa-B transcriptional activity (PubMed:17785205). Interacts with DHX9; this interaction is direct and activates NF-kappa-B-mediated transcription (PubMed:15355351). Interacts with LRRC25 (PubMed:29044191). Interacts with TBX21 (By similarity). Interacts with KAT2A (By similarity). · Human Diseases > Infectious diseases: Bacterial > Legionellosis. · Human Diseases > Infectious diseases: Bacterial > Pertussis. · Human Diseases > Infectious diseases: Bacterial > Salmonella infection. · Human Diseases > Infectious diseases: Bacterial > Shigellosis. · Human Diseases > Infectious diseases: Viral > Herpes simplex infection. · Human Diseases > Infectious diseases: Bacterial > Epithelial cell signaling in Helicobacter pylori infection. · Human Diseases > Infectious diseases: Bacterial > Tuberculosis. · Human Diseases > Immune diseases > Inflammatory bowel disease (IBD). · Human Diseases > Infectious diseases: Parasitic > Leishmaniasis. · Human Diseases > Drug resistance: Antineoplastic > Antifolate resistance. · Human Diseases > Substance dependence > Cocaine addiction. · Human Diseases > Cancers: Overview > Transcriptional misregulation in cancer. · Human Diseases > Infectious diseases: Parasitic > Toxoplasmosis. Western blotting analyses of total NF-κB p65 and phospho-NF-κB p65 in primary murine chondrocytes with or without IL-1β (10 ng/ml) for 24 h. Increased phospho-NF-κB p65 protein expression in chondrocytes from AMPKα cDKO mice compared with their WT littermates was observed. GAPDH served as a loading control. AF2006 at 1/100 staining rat lung tissue sections by IHC-P. The tissue was formaldehyde fixed and a heat mediated antigen retrieval step in citrate buffer was performed. The tissue was then blocked and incubated with the antibody for 1.5 hours at 22°C. An HRP conjugated goat anti-rabbit antibody was used as the secondary. AF2006 at 1/100 staining rat ovarian tissue sections by IHC-P. The tissue was formaldehyde fixed and a heat mediated antigen retrieval step in citrate buffer was performed. The tissue was then blocked and incubated with the antibody for 1.5 hours at 22°C. An HRP conjugated goat anti-rabbit antibody was used as the secondary. AF2006 at 1/100 staining rat uterine tissue sections by IHC-P. The tissue was formaldehyde fixed and a heat mediated antigen retrieval step in citrate buffer was performed. The tissue was then blocked and incubated with the antibody for 1.5 hours at 22°C. An HRP conjugated goat anti-rabbit antibody was used as the secondary. AF2006 at 1/100 staining human liver tissue sections by IHC-P. The tissue was formaldehyde fixed and a heat mediated antigen retrieval step in citrate buffer was performed. The tissue was then blocked and incubated with the antibody for 1.5 hours at 22°C. An HRP conjugated goat anti-rabbit antibody was used as the secondary. AF2006 at 1/100 staining human brain tissue sections by IHC-P. The tissue was formaldehyde fixed and a heat mediated antigen retrieval step in citrate buffer was performed. The tissue was then blocked and incubated with the antibody for 1.5 hours at 22°C. An HRP conjugated goat anti-rabbit antibody was used as the secondary. AF2006 at 1/100 staining human heart tissue sections by IHC-P. The tissue was formaldehyde fixed and a heat mediated antigen retrieval step in citrate buffer was performed. The tissue was then blocked and incubated with the antibody for 1.5 hours at 22°C. An HRP conjugated goat anti-rabbit antibody was used as the secondary. AF2006 at 1/100 staining mouse testis tissue sections by IHC-P. The tissue was formaldehyde fixed and a heat mediated antigen retrieval step in citrate buffer was performed. The tissue was then blocked and incubated with the antibody for 1.5 hours at 22°C. 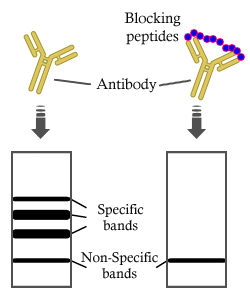 An HRP conjugated goat anti-rabbit antibody was used as the secondary. AF2006 at 1/100 staining mouse kidney tissue sections by IHC-P. The tissue was formaldehyde fixed and a heat mediated antigen retrieval step in citrate buffer was performed. The tissue was then blocked and incubated with the antibody for 1.5 hours at 22°C. An HRP conjugated goat anti-rabbit antibody was used as the secondary. AF2006 at 1/100 staining mouse gastric tissue sections by IHC-P. The tissue was formaldehyde fixed and a heat mediated antigen retrieval step in citrate buffer was performed. The tissue was then blocked and incubated with the antibody for 1.5 hours at 22°C. An HRP conjugated goat anti-rabbit antibody was used as the secondary. Representative IHC images of phospho-NF-κB p65 in the medial tibial plateau in AMPKα1α2 conditional double knockout (AMPKα cDKO) mice and their WT littermates 2 weeks post-sham operation and DMM surgery or in mice at 9 months of age. Scale bars = 20 μm. The cellularity of the section was confirmed with haematoxylin staining. AF2006 staining HeLa by IF/ICC. The sample were fixed with PFA and permeabilized in 0.1% Triton X-100,then blocked in 10% serum for 45 minutes at 25°C. 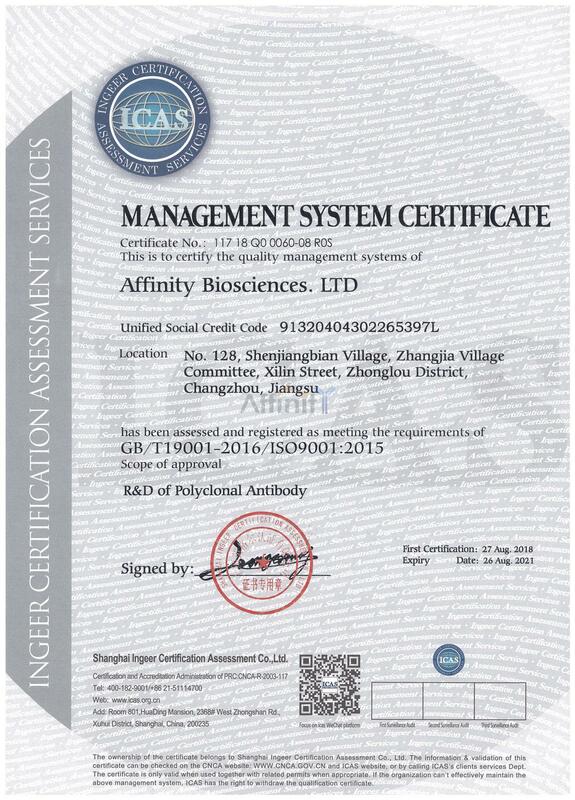 The primary antibody was diluted at 1/200 and incubated with the sample for 1 hour at 37°C. An Alexa Fluor 594 conjugated goat anti-rabbit IgG (H+L) Ab, diluted at 1/600, was used as the secondary antibody. AF2006 staining lovo cells by ICC/IF. Cells were fixed with PFA and permeabilized in 0.1% saponin prior to blocking in 10% serum for 45 minutes at 37°C. The primary antibody was diluted 1/400 and incubated with the sample for 1 hour at 37°C. A Alexa Fluor® 594 conjugated goat polyclonal to rabbit IgG (H+L), diluted 1/600 was used as secondary antibody. ELISA analysis of AF2006 showing specificity to Phospho-NF kappaB p65 (Ser536) peptide. Peptides concentration: 1ug/ml. (c) Western blotting analyses of total NF-κ B p65 and phospho-NF-κB p65 in primary murine chondrocytes with or without IL-1β (10 ng/ml) for 24h. Increased phospho-NF-κB p65 protein expression in chondrocytes from AMPKα cDKO mice compared with their WT littermates was observed. GAPDH served as a loading control. Figure 6. IHC analyses of surgically induced and ageing-associated OA. (a,c and e) Representative IHC images of MMP-3, MMP-13 and phospho-NF-κB p65 in the medial tibial plateau in AMPKα1α2 conditional double knockout (AMPKα cDKO) mice and their WT littermates 2 weeks post-sham operation and DMM surgery or in mice at 9 months of age. Scale bars=20μm. The cellularity of the section was confirmed with haematoxylin staining. Fig 5. The expression of p-p65, p-AKT and Bcl-2 (protein level) in U2-OS cells treated by LY294002 or/and Estrogen receptor β (ERβ) siRNA in the presence of 10-10 M E2. FIGURE 3: Pro-inflammatory factors, anti-oxidant enzyme and cell signaling pathways in resveratrol (Res)- or vehicle-treated cystic kidneys. (A) TNF-α, MCP-1, CFB and SOD2 were analyzed by western blot in 9-week-old +/+ and Cy/+ kidneys. (B–E) Immunohistochemical staining for oxidative stress markers 8-OHdG and nitrotyrosine in the tubulointerstitial area. Computer-assisted morphometry was used to quantify changes of 8-OHdG and nitrotyrosine in each group. Scale bar = 50 µm. (F) NF-κB pathway ( p-p65, p65, p105 and p50) and mTOR pathway ( p-S6K and total S6K) were analyzed by western blot in 9-week-old +/+ and Cy/+ kidneys. Blots are representative of three independent experiments. Figure 7. FCN-A promoted the M1 polarization of BMDMs through a TLR4/MyD88-dependent pathway in vitro. (a) The protein expressions of the purified GST-FCN-A and GST were determined by SDS-PAGE. (b) The extracted membrane proteins from RAW264.7 cells were incubated with the purified GST-FCN-A or GST proteins. Co-IP analysis of the interaction between TLR4 of macrophage and GST-FCN-A was performed by using anti-TLR4. Rabbit IgG was used as a negative control in co-IP. (c, e) BMDMs, isolated from WT, TLR4-/- or MyD88-/- mice, were stimulated with FCN-A (10g/mL) for 24 h, then the expressions of iNOS and Arg-1 from BMDMs were examined by Western blot analysis. (d, f) The levels of pro-inflammatory cytokines IL-1in cell lysates, and secreted IL-6, TNF- were detected by ELISA. (g, h) Western blot analysis of p-IRAK1, p-p65, p-ERK1/2, and p-JNK in the BMDM lysates of TLR4-/-, MyD88-/- or WT after stimulation with FCN-A for 0-45 min. In d and f, values are mean ± [SEM] from three independent experiments.